To add fun, interest, variety and balance to the programme. To give children something to aim for and to reward achievement. To help develop a sense of co-operation and team work in the group. The first badge the children can work towards is their membership badge. They will get this by completing their ‘Way into the Y-Team’ booklet. (Can be purchased from NHQ stores) This is an introduction into the Y-team where the children will learn about Brigade by completing puzzles and activities throughout it. With their badge they will also be presented with their Y-team membership card which will have their name on, their company and the Y-team prayer on. 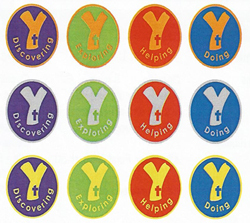 The Y-team then has four badges that they can work towards each year: Doing, Exploring, Helping and Discovering. To gain a badge the member will need to gain four stickers for that area so altogether 16 stickers should be earned throughout the year to gain all four badges. These stickers are kept on their own individual certificates. In the first year of the Y-team (age 7/8, year 3) the members can work towards their bronze badges, in the second year (age 8/9, year 4) they can work towards their silver badges and in the third year (age 9/10, year 5) they can work towards their gold badges. There is also Special Interest Badges that they can be earned by Brigade leaders recognising the member’s hobbies interest outside of Brigade. These are for Sport, Music, Swimming, Drama and Hobbies. All the badge work schemes can be found in the Y-team leaders’ Databox (Can be purchased from NHQ stores) which is a useful tool with all the instructions and ideas to get the members through their badge work. This can be developed by your Y-team Leader to adapt to meet the needs and abilities of your company and members.